OK. Having looked at the Org 1 Concept Map, let’s ask the next logical question: what does a typical Org 2 course look like? Org 1 is largely about sp3 hybridized (i.e. tetrahedral) carbon. We learn about bonding, geometry, conformations, -> stereochemistry <– (notice the subtle highlighting) and reactions of sp3 hybridized carbon. Even when we cover the reactions of sp and sp2 hybridized carbon (i.e. alkenes and alkynes) we are largely focusing on the sp3-hydbridized products obtained, and describing their regiochemistry and stereochemistry. Org 2 – once you get the unit on alcohols out of the way – is largely about sp2 hybridized carbon. Stereochemistry, which was such an integral part of org 1, does not play as important a role. Nor does conformational analysis – you likely won’t be seeing many Newman projections or even cyclohexane chairs! Instead, the common thread that runs through the key chapters can be described as π-systems, molecular orbital theory, or, perhaps more crudely – resonance. Another key difference is that Org 2 isn’t as blatantly conceptual. Unlike Org 1, which is maybe 50% conceptual chapters and 50% chapters on reactions, Org 2 is pretty much all reactions. There are really only two fundamental new concepts introduced – aromaticity and orbital symmetry. [Note that I’m not counting spectroscopy here, which is usually wedged in somewhere either at the end of Org 1 or the beginning of Org 2]. If Org 1 is “Star Wars: A New Hope”, which begins slowly and has to introduce all the main characters, Org 2 is “The Empire Strikes Back”: action, action, action from beginning to end. Org 2 truly begins with a chapter on π-systems (i.e. conjugation). This chapter covers π-bonding in molecules where there are more than two adjacent p orbitals – dienes, allylic systems – and explores how the molecular orbitals build up. An understanding of molecular orbital theory is essential to be able to grasp the key reactions of aromatic systems, pericyclic reactions, and carboxylic acid derivatives, so this chapter is truly the “bedrock” of Org 2. 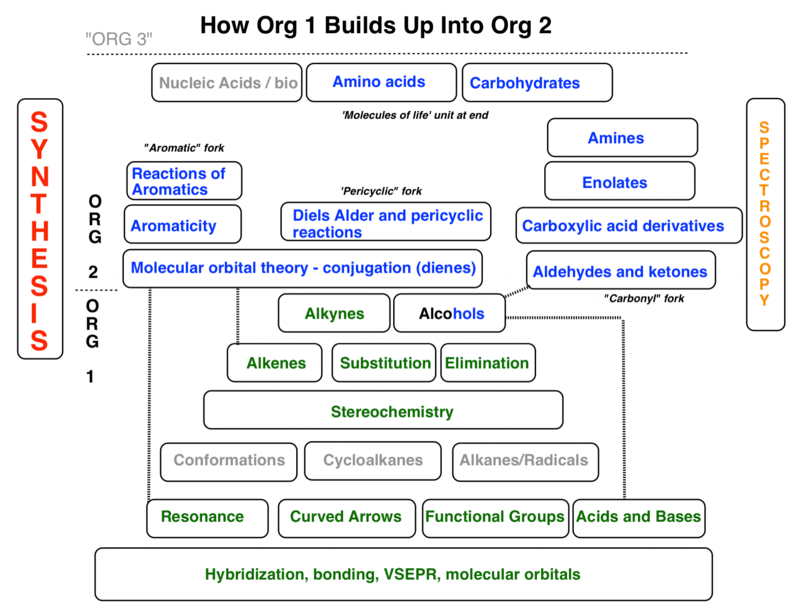 Instead of building up like a pyramid, like Org 1 does, I tend to see Org 2 as proceeding along three main “forks”, with a somewhat disconnected section on biomolecules at the end. From molecular orbital theory the course can then progress to an introduction of aromaticity ( a new fundamental concept describing why certain unsaturated cyclic compounds are unusually stable) and then the reactions of aromatic derivatives. This is a good arena to re-introduce multi-step synthesis, as the substituents on aromatic rings have a great deal of influence on their reactivity. These lessons will be useful when the course turns to carbonyl chemistry, where synthesis will require a lot of detailed planning. The Diels Alder reaction of dienes is a fundamentally different type of reaction from those that have been encountered before in the course, and a grasp of molecular orbital theory is necessary to understand 1) why it works the way it does, and 2) how it gives rise to different patterns of regioselectivity and stereoselectivity. Time permitting, the course can also go into further reactions in the same “family”, including electrocyclic ring opening/closing, the Cope rearrangement, and others. “Fork 3”: Carbonyls, Carboxylic Acid derivatives, Enolates (main sequence). From the chapter on enolates the course then usually proceeds through amines – a mish mash of many different reaction types encountered throughout Org 1 and Org 2 – and then ends with a few units on biomolecules, including carbohydrates, amino acids, and (sometimes) nucleic acids/terpenes/fatty acids. The good news is that these latter chapters are relatively self-contained. Be forewarned that the chapter on carbohydrates includes a lot of reactions and nomenclature that only get used within a very narrow context. So what makes Org 2 so difficult? It’s really no secret. The pace at which new reactions are introduced makes Org 2 a very challenging course. And it’s not merely a matter of volume, either – there are network effects too. As the course progresses, so does the complexity of synthesis problems – which will ask you to bring your knowledge of these reactions to bear on describing reaction sequences that will build up complex molecules from simpler precursors. Reactions from Org 1 (such as nucleophilic substitution) are not excluded, by the way. A sub-problem in the “lots of new reactions” category is that unless you put in a lot of time working problems, many of the reactions will look very similar (especially with carbonyls). It’s common to get the feeling that there’s some deeper patterns and organization but you can’t quite put your finger on it. Finding time to put it all together in your head is hard, especially with things moving so fast – it’s can be like trying to play Jenga in the back of a racecar. Let’s conclude. So what’s the point of all of this, anyway? In my view, the real jewel of organic chemistry 2 is the skill of synthesis. By the end of Org 2, you’ve toured all the major functional groups, and should be able to take a simple small- molecule target with a functional group or two and be able to figure out a sequence of reactions that will build it from smaller building blocks. This requires learning a tremendous amount of new material and concepts, putting them all together in your head, and then being able to apply this knowledge to solve problems. It takes a lot of work and a lot of time to get right – but it’s an extremely powerful feeling. For me, it was a feeling of being on a mountaintop after a tremendous amount of slogging in the weeds. Putting everything together to make a coherent whole, and then realizing, “oh geez, we’ve really only scratched the surface here”. There’s a reason why people make the study of organic chemistry their life’s work – it’s extremely deep. P.S. Where does “Org 2” end and “Org 3” begin? I’d say it’s when we start having to deal with multiple functional groups in the same molecule that can potentially react. From Org 3 onwards, we really start to focus on the issue of “selectivity” : selectivity between functional groups (“chemoselectivity”), selectivity for synthesis of various stereoisomers (“stereoselective synthesis”), and designing the synthesis of ever more complex molecules from an ever-growing arsenal of reactions.